If the relaxation of hukou (residence permit) regulations announced by the State Council is actually enacted in practice, this will have a profound effect on healthcare access for a quarter of a billion Chinese. This week the State Council announced that local governments were being instructed to adopt new regulations that will allow nonresidents to get a household registration. This registration will give the floating rural migrants access to basic public services such as education and healthcare, and family planning services. 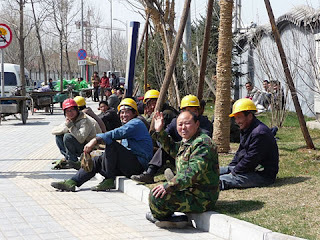 The changes could potentially affect 270 million internal migrants who have moved from rural areas or regional small towns to the larger and more prosperous cities of China. Until now this floating population has been denied access to healthcare facilities in the cities, leading to the development of many unofficial backstreet clinics. The main problem for migrant workers was that their hukou only entitled them to healthcare in their place of residence registration. This also applied to their children. However, it pays to read the fine print - this does not mean that city hospitals will be immediately swamped by rural migrants seeking healthcare. The new regulations say that city governments should extend 'basic' services only to nonresidents who qualify for residence via a points test based on factors such as length of residence (as much as seven years) and stable employment. Many rural migrants will only qualify for temporary residence cards in the cities, which may limit their access to healthcare. According to Xinhua, the State Council made the changes because "if these issues can not be effectively addressed in the long-term, it will trigger a series of social risks and contradictions." The other questions being asked in the Chinese media are: what are the criteria that will allow a nonresident to acquire city registration? Also, what level of services will the be eligible for? Another important question being posed by analysts is what kind of effect the widening of hukou system will have on current city residents? Will they be crowded out of hospitals and healthcare service by the onrush of outsiders? One expert from the Renmin University, Beijing, also pointed to a potential problem with the loosening of the hukou system: the degrading of the funding base for rural health services. Professor Yang Junhua said many rural areas had already seen huge migration from the their towns and villages, depleting their tax revenue base, meaning they were unable to support services for the 'left behind' residents who tended to be either older and retired or young children. Allowing rural residents to switch their hukou to cities would further undermine the viability of rural healthcare services, he warned. Professor Yang also predicted that there would be resistance on the ground from city governments to implementing the new regulations, and thus the central government would have to be strict in monitoring and enforcing the rollout of any hukou reforms. Nevertheless, if fully implemented the new residency regulations are a 'game changing' step for China and have major implications for healthcare. The 'floating population' have long been neglected in terms of healthcare and many of the rural migrants in cities have poor healthcare as a result: unable to access health services they have missed out on basic services such as vaccination, leading to outbreaks of infections such as measles. The new residency rules could have more of an impact on China's healthcare system than the recent more widely publicised two child policy.